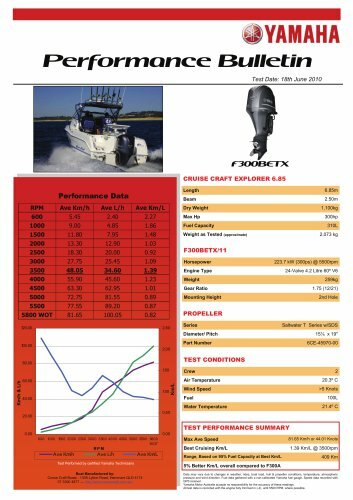 Performance Bulletin Test Date: 18th June 2010 F300BETX CRUISE CRAFT EXPLORER 6.85 RPM est Performed by certified Yamaha Technicians Boat Manufactured by: Cruise Craft Boats - 1308 Lytton Road, Hemmant QLD 4174 07 3390 4877 — http://www.cruisecraft.com.au/ Data may vary due to changes in weather, tides, boat load, hull & propeller conditions, temperature, atmospheric pressure and wind direction. Fuel data gathered with a non-calibrated Yamaha fuel gauge. Speed data recorded with GPS receiver. Yamaha Motor Australia accepts no responsibility for the accuracy of these readings. All test data is recorded with the engine fully trimmed in (-4), until 5500 RPM, where possible.